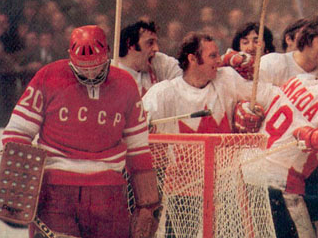 A dejected Vladislav Tretiak ignores celebrating Canadians. The Russian equipment was old and ratty. Their uniforms had patches like a hand-me-down quilt. The captain wore a "K" over his heart. The goalie wore No. 20, a defenceman's sweater. Their names — Mikhailov, Yakushev, Tsygankov— were barely pronounceable and certainly unspellable. They all wore helmets (the sissies). Canadian boys said it made them look like robots. Had they come from Mars, the Soviet Union's best hockey players could not have looked more alien. Today, 25 years to the day that Paul Henderson's improbable goal decided the Summit Series, when Pavel Bure is a Vancouver Canuck and the Stanley Cup has been paraded through Moscow streets, it is hard to remember just how rare it was for Canadians to see a person from the Soviet Union, never mind an entire fast-skating, crisp-passing team of them. Stalin was long dead in 1972. Igor Gouzenko, the cipher clerk who defected with tales of Soviet espionage rings, appeared in public only with a bag over his head. For most Canadians, the only Russian to have a name was Soviet leader Leonid Brezhnev, round and stiff like a matreshka doll, albeit one with comic eyebrows. The battle for hockey supremacy was supposed to be a pushover for Canada's professionals. Infamously, Canada's scouts watched Soviet goalie Vladislav Tretiak play a single game. He was a sieve, and that's what they reported. What they didn't know was that the hungover Tretiak had been married the day before. Johnny Esaw, the CTV broadcaster, was so certain that Canada was to win in eight straight that he chose to air Games 1, 3, 5 and 7 on his network; he felt viewers would lose interest as the Canadians crushed their opponent. CBC got to air the decisive Game 8. By that time, the series had become less an exhibition and more a crusade. It was Sept. 28, 1972. Elementary school pupils gathered in gymnasiums to watch on television. A federal election campaign was ignored for a day. Workplaces slowed, then stopped during the third period. Foster Hewitt did the play-by-play on television, while Bob Cole did the same on radio. Those who watched and listened have not forgotten the precise moment when, in the final minute of the final period of the final game, Paul Henderson, a forward blessed with more perseverance than skill, slipped a rebound past Vladislav Tretiak. Ron Butlin, who now lives in Victoria, was among the whistling, enraptured spectators at Luzhniki Arena in Moscow, an outdated rink where fans behind the goals were protected by proletarian mesh and not bourgeois plexiglass. His strongest memory is not so much Henderson's goal, but the arrival of a Soviet V.I.P. "The Russians jeer by whistling and they were making quite a noise," he said, recalling Game 8. "All of a sudden, the whistling stopped, absolutely stopped. It was so quiet you could hear the skates of the players down on the ice. I looked around and saw Brezhnev walking through the stands to get to a private box at the top of the arena. Until he sat down, there wasn't a sound. "Midway through the third period, Brezhnev got up and again there was silence, except for the blades of the skates cutting the ice. Once he was gone, everything resumed. "It was either fear, or respect, or both. Those were the days of tough Communism." The series had become a showdown between more than just two hockey teams, but between rival systems - Communism vs. capitalism, collectivism vs. individualism. Team Canada considered their rivals to be unthinking automatons, obedient to their system, incapable of adapting to circumstance or of allowing individual flare to flourish. For their part, the Soviet skaters felt the pros played only for money, not for pride of country. How wrong they were, too. Away from the series, among fans, fantastical rumors took hold. It was said here Tretiak had been forced to have surgery to replace his ligaments with artificial ones. The Russians, in turn, believed that goalie Tony Esposito had a plate implanted in his forehead, the better to withstand shots to the head. The "To Russia With Hull" campaign; the shocking 7-3 Soviet win at the Montreal Forum to open the series; Pete Mahovlich's brilliant dipsy-doodle goal in Toronto; the booing spectators at Pacific Coliseum in Vancouver and Phil Esposito's impassioned, drenched-in- sweat, post-game monologue on national TV ("To the people of Canada, I say we tried. We did our best. We're really disheartened, disappointed and disillusioned. We can't believe we're getting booed in our own building. I'm really, really disappointed. I can't believe it. Some of our guys are really down in the dumps. They have a good team. Let's face facts. We came because we love Canada. I don't think it's fair that we should be booed"); the defection of four Team Canada players who returned home from Moscow; "da da Canada, nyet nyet Soviet"; indecipherable referees named Kompalla and Baader (the players called them Baader and Worse); Bobby Clarke's vicious two-handed slash of Valeri Kharlamov's ankle; Alan Eagleson's scuffle with Soviet officials during Game 8; his rescue from armed soldiers by Pete Mahovlich; Eagle's flipping a one- finger salute to the crowd from the ice; and, unforgettably, Henderson's goal. "As we got into the last minute of play," Henderson reminisced in Shooting for Glory, his 1992 autobiography, "I stood up at our bench and yelled three times at Peter Mahovlich to come off so I could get on the ice. It wasn't our line's turn, but I honestly felt I could get a goal. I can't explain why, but I just had this feeling, just as I'd had in the previous game. For whatever reason, Peter came to the bench and I catapulted myself over the boards to join the play in the Russian end. As I got on, the puck went to Cournoyer on the far boards. I screamed at him for a pass that I hoped to one-time at the net because I had a clear shot, but I had to reach back for the puck with all my momentum pushing me forward. I missed and their defenceman neatly tripped me, causing me to fall and slide into the boards behind their net. Immediately I thought, Get up. Get the puck and come back down to try to score. "The Russians, with a great chance to clear the zone, failed to control the puck, allowing the relentless Phil Esposito to whack the loose disk towards the goal. Tretiak stopped Phil's shot but couldn't smother it. By this time I was standing alone in front of Tretiak to pick up the rebound. I tried to slide a shot along the ice, but Tretiak got a piece of it. The puck came right back to me, and with Tretiak down I slid it along the ice for the winning goal. There were only 34 seconds left to play!" He leaped into Cournoyer's arms, an image captured by Toronto Star photographer Frank Lennon. Henderson, elated, is staring straight at the camera. So, too, is Tretiak, as he lifts his back off the ice, helpless as an upended turtle. To their left, Soviet defenceman Yuri Liapkin, a look of disbelief on his face, appeals silently to the referee for - what? A reprieve? The series was over. Canada had won. Twenty-five years later, as they gather in Toronto for an exhibition to be played in their honor, Team Canada's alumni are pot- bellied and balding, enjoying the fruits of their labors in their 50s. Bill Goldsworthy has died of AIDS, Kharlamov in a car wreck, but otherwise most are in comfortable circumstances. The image of Henderson being hugged by Cournoyer has become an icon, reproduced - for profit - on posters, coins, book covers, and, unveiled just this week, a postage stamp. Meanwhile, on a farm in Ontario, Pat Stapleton claims to have put Henderson's puck in a box with many others. Some have come to his door with money in search of this Holy Grail of the series, but Whitey is having none of it. His dream is to play shinny with his grandchildren on a frozen slough, and to lose the puck in a snowbank. What's black and white and whistles? Lonnie Cameron (right) worked his final NHL game as a linesman on April 2, 2019. Kelsey Chow, age eight, brought a zebra to her Grade 3 class for show and tell on Tuesday. It weighed 225 pounds and had a black and white coat. Its name was Lonnie Cameron. Cameron is a linesman -- a zebra in hockey slang -- and his natural habitat is the rinks of the National Hockey League. The Victoria native came to View Royal Elementary with a message. "Whatever you guys do," he told Kelsey's class, "try to be the best you can be at whatever you do." Cameron, 35, wore his No. 74 black-and-white sweater with an orange NHL crest over his heart. He brought his hockey equipment, including a girdle and skates and shin pads, as well as a whiskey bag filled with whistles. The kids liked the whistles; they thought the hockey gear was stinky. "I think I have a really cool job," he said. Most hockey fans think linesmen have a thankless job that rarely wins them respect. Their daily chores seem mundane compared to the glamour afforded referees with their orange armband and a benevolent dictator's command. "Kelsey, what does the linesman do?" A linesman's job description includes calling icings and off- sides, dropping the puck for face-offs, and helping the referees maintain order on ice. Often that means sticking their noses into fights they would rather avoid. The NHL rule book has 103 entries and Cameron is supposed to be able to recall any of them at a moment's notice. "And if she gave me that look," he said, indicating Kelsey's scowl, "she's in the penalty box." Cameron has known little Kelsey since the day after she was born eight years ago to Ross and Lynn Chow. The linesman went to kindergarten with Ross and the families have kept in touch as Lonnie's hockey career took him from Juan de Fuca to Racquet Club to junior in Estevan, Sask., where his dreams of following Ken Dryden as an NHL goalie came to an end. 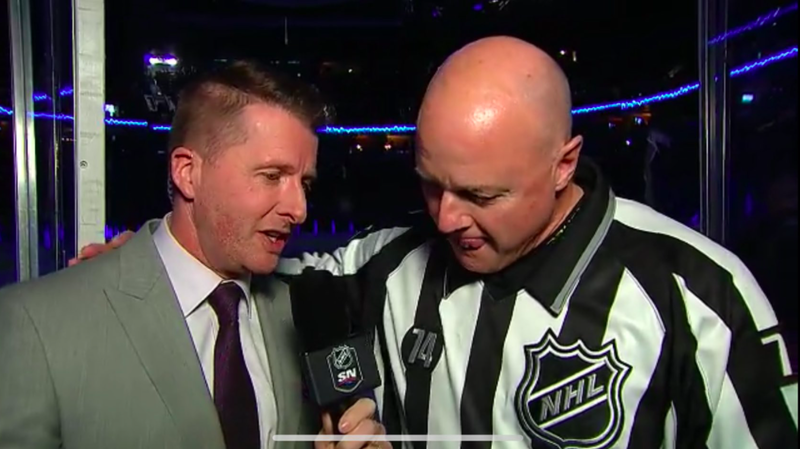 Instead, Cameron decided to become an official, working in the Western Hockey League where he won the Allen Paradice Memorial Trophy in 1995-96 as the league's top referee. Cameron also was on the ice for the hockey finals at the 1994 Olympic Games. He made his NHL debut on Oct. 5, 1997. While some educators may occasionally find need of a linesman's assistance, teacher Catherine Harrower runs a tight ship. In fact, the children in Mrs. Harrower's class are far better behaved than the scofflaws Cameron encounters in his working life. Just last year, Philadelphia Flyers coach Roger Neilson was suspended two games for throwing a stick on the ice that almost hit Cameron. Earlier on Tuesday, Cameron addressed the intermediate students at View Royal with an inspirational message. "If you set a goal, always try to achieve it," he told them. "Shoot for the stars. If you hit the moon, that's just a speed bump." Later, he said, "It's kind of corny, but I believe in that." With 30,000 officials working in sports in Canada, Cameron told Kelsey's class that he landed one of only 60 jobs open for refs and linesmen in the NHL. Cameron had a trick question in his classroom quiz. How many teams are on the ice during a game? "Three teams," Cameron said. "We as officials work as a team. If the team in black and white isn't doing their job, they'll know about it from the fans." The linesman gave an autographed photo to each students. It showed him standing to the side as Donald Brashear punches the face of Marty McSorley. "These guys aren't really getting hurt," Cameron cautioned the class. "It's all make believe." After the presentation, the class returned to their study of insects such as the ladybug (not Lady Byng) and the cockroach (not Claude Lemieux, but close). Mrs. Harrower was not much of a hockey fan before show and tell. "When I heard that Kelsey was bringing a linesman, I had no idea," she told her class. "I thought he climbed poles." After a career lasting nearly eight decades, including a stint as a war correspondent in the final weeks of the Second World War, Ms. Iglauer has died at 101 in Sechelt on the British Columbia coast, an area where she spent much of the last half of her life. In the pages of magazines such as Harper’s, The Atlantic and, particularly, the New Yorker, whose staff she joined in 1961, she chronicled a vast land and its peoples for an American audience often indifferent to “the strangers next door,” a phrase used as the title for her collected works of journalism. She was an unsentimental writer with a gimlet eye, rendering her pieces with prose as bracing as the geography in which many of the stories were set. Her works were informed by a Chekhovian attention to detail, perhaps no surprise as she had devoured the Russian classics not long out of grade school after the school librarian provided a copy of Tolstoy’s “Anna Karenina” at age 12. Ms. Iglauer displayed the standards of an upper middle-class upbringing — elegant blouses, a confidence about etiquette, and an attention to coiffure, which, late in life, was rendered as a gloriole of silvery hair framing a fine-boned face. She was blessed with a journalist’s most useful quality — a curiosity for which there seemed no satisfying. Summer weekends were spent at a cabin on the Chagrin River in the Ohio countryside, where Edith rode horses and developed a passion for rural life. Her mother devoured books and displayed exquisite taste, while her more adventurous, free-spirited father exulted in the natural environment. Late in 1933, even as many struggled through the deprivations of the Depression, the family enjoyed a week-long cruise aboard the ocean liner Mauretania from New York to Halifax and back, likely her first visit to the country she would interpret for her countrymen. After the bombing of Pearl Harbor, Ms. Iglauer joined the Office of War Information, where she worked on the religion and Scandinavian desks for the radio newsroom, relaying news to those surreptitiously listening in Norway and other Nazi-occupied countries. She convinced a senior officer to include Eleanor Roosevelt’s weekly White House press briefings in her work routine, forging a friendship with the First Lady. In 1945, Mr. Hamburger was dispatched to Europe as the New Yorker’s correspondent in the Mediterranean Theatre, where he covered the execution of Italian dictator Benito Mussolini. Ms. Iglauer, who continued to use her maiden name for professional purposes, traveled to Yugoslavia via Casablanca, filing stories to the Cleveland News, whose readership included many who traced their ancestral roots to the Balkans. Even a short time in a war zone convinced her of the folly of armed conflict. “The shocking destruction from bombings that I saw everywhere, especially in London, made a confirmed peace marcher out of me,” she told a convocation audience while accepting an honorary degree at the University of Victoria in 2006. After the war, they set up housekeeping in railroad apartment (small rooms connected in a row without a separate hallway) on the third floor of a walk-up tenement. Mr. Hamburger resumed his career at the New Yorker. After the couple announced a pregnancy, Harold Ross, the magazine’s founder, asked their landlord, who happened to be a friend, to find the couple a larger apartment. 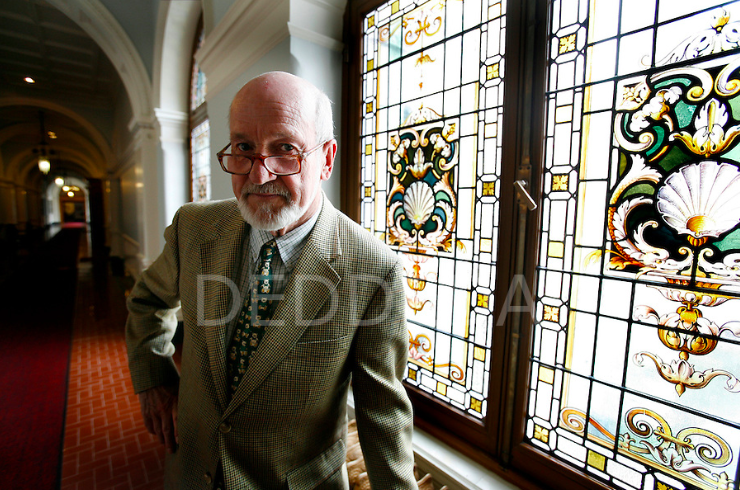 The landlord was Vincent Astor, millionaire head of the famous aristocratic family. The union was a happy one until the night Mr. Daly died suddenly of a heart attack at a community dance four years after their marriage. In her grief, Ms. Iglauer wrote her most famous, and autobiographical, work, which was shortlisted for the Governor General’s Award for Non-fiction in 1988. Other notable books include “Seven Stones,” a biography of Mr. Erickson published in 1981, and “Inuit Journey” (2000), an updated and revised version of her first book, “The New People,” published in 1966. She died at Sechelt Hospital on February 13. She leaves two sons, Richard Shaw Hamburger, of New York, a theatre director, and Jay Philip Hamburger, of Vancouver, founder and artistic director of Theatre in the Raw, and their families. Her marriage to Mr. Hamburger ended in divorce in 1966 and he died in 2004, aged 89. She was also predeceased by her second husband, Mr. Daly, who died in 1978, and her third husband, Mr. White, who died in 2015, aged 101. 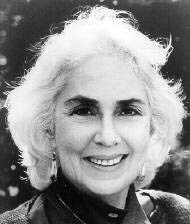 Her older sister, Jane Iglauer Fallon, a patron of the arts and inductee to the Cleveland Play House Hall of Fame, died in 2002, at 89. Ms. Iglauer displayed a dogged attention to detail notable even for the glacially-paced New Yorker of the era. In 1972, she finished an article on the building of the foundation for the World Trade Center, the story taking longer to complete than the foundation itself. Players recreate the 1838 game between Beachville and Zorra as described by Adam Ford. Photo from the Beachville (Ont.) District Museum. NO ONE REMEMBERS how old Old Ned Dolson was when they started calling him Old. All that is known is that Old Ned hailed from Zorra Township and was about as fine a baseball player as had ever been seen in those parts. So when the hard-working farmers of the area, near London, Ont., took a break from their chores on the King's birthday 150 years ago today, Old Ned was asked to bring his team, The Zorras, down to nearby Beachville for a game against the locals. Among the spectators was a 7-year-old boy named Adam Ford, who was so impressed by this new sport that he never forgot it. Years later, Ford, a medical doctor and dipsomaniac, penned his reminiscences of the game. The account he wrote stands today as the first recorded evidence of baseball being played. 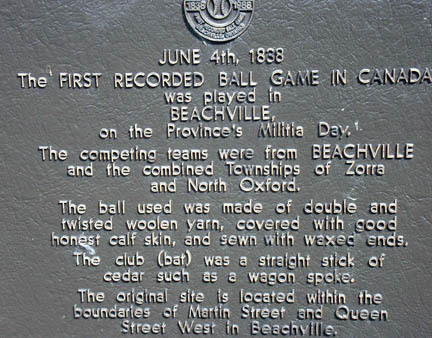 That historic game will be replayed tomorrow, when Beachville residents challenge their neighbors from Zorra to a rematch under the primitive rules of 1838. As if to make up for decades of neglect, this lost chapter in Canada's sporting history is being celebrated with a full lineup of commemorative events this weekend, including the induction of five players into the Canadian Baseball Hall of Fame at a banquet in Ingersoll tonight. Old Ned and all the other players from those two pioneer teams also will be inducted. All this fuss is the result of a letter written by Ford to Sporting Life, a Philadelphia publication, in 1886. The correspondence describes in detail the players and rules of that early Beachville game. 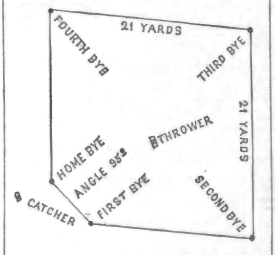 Ford also included a drawing of the playing field with its knocker's stone (home plate) and five byes (bases). But because he wrote the account almost 50 years after having seen the game as a child, some doubted the accuracy of his recollection. A pair of academic detectives from the University of Western Ontario, however, have traced the names cited by Ford through land records and tombstones. "This is beyond hearsay," says professor Bob Barney. "It's the oldest recorded validation. It fits another picture in the puzzle of baseball's opaque history." Barney, who worked with graduate student Nancy Bouchier, says Canada's claim to the American game leaves some of his fellow academics in a dither. "The reaction is one sometimes of disbelief, sometimes of scoffing," he said. The New York village of Cooperstown was identified earlier in this century as the site of the first recorded game of baseball. Abner Doubleday, who would go on to become a Civil War hero, supposedly organized the first baseball game there in 1839. Latter-day research has debunked that notion. It is now generally agreed that the Doubleday myth was fostered by baseball entrepreneur A.G. Spalding, a founder of the National League and of the sporting goods business that still bears his name. Spalding was keen on creating a suitably patriotic beginning for America's national pastime. Ford descries the Beachville game being played on a smooth pasture behind Enoch Burdick's carpentry shops. No one knows the score, or even who won, and it probably didn't matter much at the time. The game was simply a pleasant diversion from long hours of labor. It was Militia Muster Day, and a company of Scottish volunteers, raised to fight the rebellion of the previous year, stopped to watch. They saw George Burdick, Adam Karn, and William Hutchinson from Beachville take on Old Ned Dolson, Nathaniel McNames, and Harry and Daniel Karn from Zorra. Dolson was so good it was said he could "catch the ball right away from the front of the club if you didn't keep him back so far that he couldn't reach it." They played with a calfskin ball made of double and twisted woolen yarn fashioned by a shoemaker. Bats were rough-hewn blocks of cedar, although some used a wagon spoke. The field was square, with the first bye only 18 feet from the knocker's stone. The idea was to allow runners on the bases, because it was considered fun to put them out. A runner was out if he was soaked — hit by a ball thrown by the fielding team. Players dressed in their work clothes and wore no gloves. A striker (batter) was out even if his hit was caught on the first bounce. A game could last from six to nine innings, and teams fielded from seven to 12 players at a time. Sometimes, games ended when one side scored 18 (or 21) tallies (runs), which were recorded by cutting a notch into a stick. It was while verifying Ford's account that Barney and Bouchier learned that Canada's first baseball chronicler led a life so rich in baseball and scandal it might have come from the pen of William Kennedy. Ford seemed a paragon of Victorian virtue. 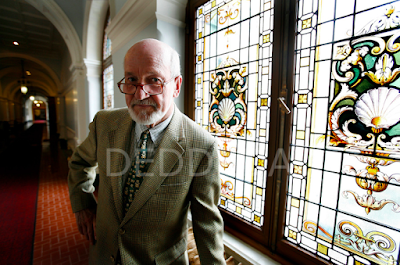 He had a successful practice and was involved in both civic and sporting affairs. He was even elected mayor of St. Marys, Ont., in the 1870s. But the mayor had a weakness for alcohol, and it was his undoing. St. Marys had an active temperance movement at the time, and the doctor was known to use a drug to lessen the effects of his drinking. (Which drug he took remains unknown.) At a party in his office, the doctor administered the drug to his drinking partner. The man suffered a violent reaction and died. As luck would have it, the man was secretary of the local temperance union. Charges were eventually dropped, although an inquest revealed that a young woman was also involved in the now notorious drinking party. "The entire town was scandalized," Barney says, "even though it never went to trial." Ford abandoned his wife and a son in St. Marys to flee to Denver with his other son. He organized the first curling bonspiel west of the Missouri River there, and wrote his letter to Sporting Life. Unfortunately, he descended into alcoholism and died penniless. He had spent his days caring for his son, who had become addicted to morphine. The site of the game he described is now home to homes and a church. The re-enactment is being played on a nearby school ground. As well, Tom Heitz, librarian with the Baseball Hall of Fame in Cooperstown, N.Y., is bringing his Leatherstocking Base Ball Club to Beachville for an 1838-style game this afternoon. The Leatherstockings, who count an innkeeper and several students on their roster, are in their fourth season of playing baseball under old rules. They wear plain red workshirts and Amish-style twill pants to better resemble their predecessors. They play about seven road games a year, and today's match marks their longest journey yet. "You really feel at times that you've stepped back into another century," Heitz said. "The form of baseball we will play (today) is a more primitive form than even we're used to." A practice game played last month surprised organizer Bill Riddick of Ingersoll, who stepped up to the knocker's stone wielding a big stick. "It was like a Hydro pole," he said of a hand-made bat that was more than four feet long. "It would have taken a mighty big man to swing that. And the ball was so soft, it was like a Nerf ball." Still, Heitz says his Leatherstockings are ready. "You don't need a great deal of skill," he says. "You just have to think a little differently. All this game really requires is unbridled enthusiasm and joy. Enthusiasm and joy, that's baseball."